The youngest person deals first. The deal will rotate clockwise. Match the correct word found within the lyrics of the song. 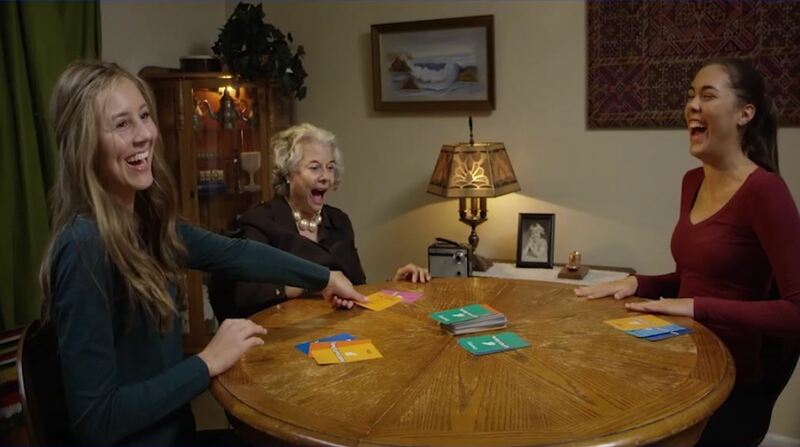 First, draw the top card from the stock pile. Announce the genre on the back of the card. Turn the card over and announce the song title and the list of four words. When an answer is given, the dealer rubs his finger over the embossed indicators at the bottom of the card, to identify the list number of the correct word. Next, if the word is correctly matched with the song title, the dealer issues the card to the player, to place in their stock pile. If the word is incorrectly matched with the song title, the dealer places the card facedown in the discard pile. Play now moves to the next player. The dots give you the answer! One to four raised dots are found at the foot of each card. If there are two dots, the word found within the lyrics of the song is list item number two. It's that easy! Designed for those with low vision. 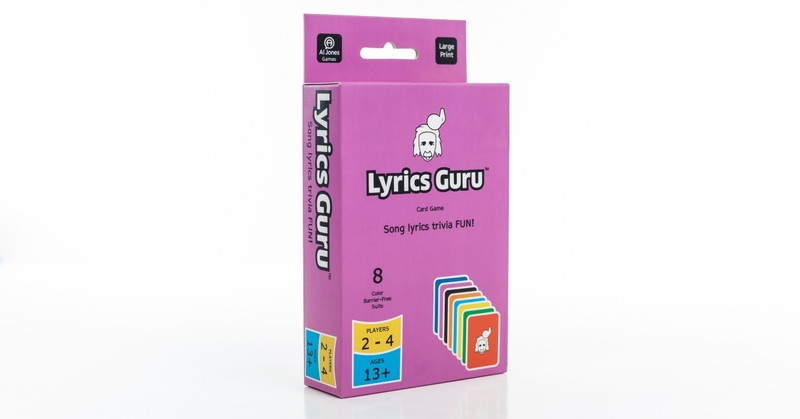 See why this song lyrics trivia game with jumbo sized cards, eight color barrier-free suits, large text and embossed indicators is such a popular game. Be the first player to collect eight cards, one of each music genre. Are you a casual/family style restaurant owner seeking a guest entertainment solution? 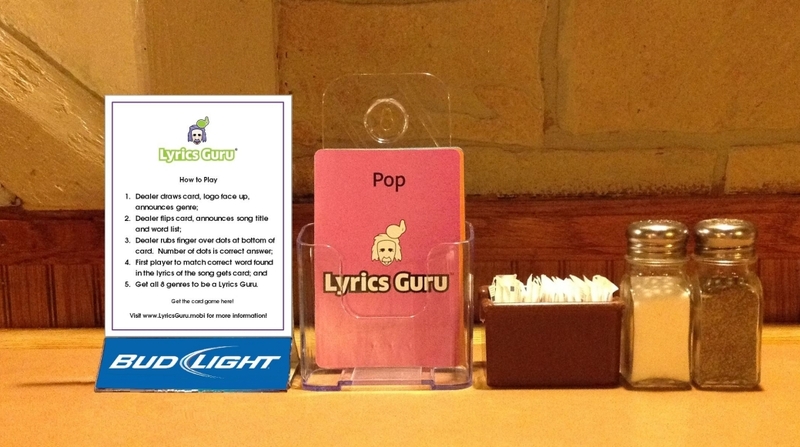 Contact us to learn how we can create a fun and memorable dining experience in your establishment, with the playing card version of the song lyrics trivia game, Lyrics Guru. We offer competitive profit margins to upsell the complete deck vs bottled alcoholic beverages. Help your local school raise needed money. 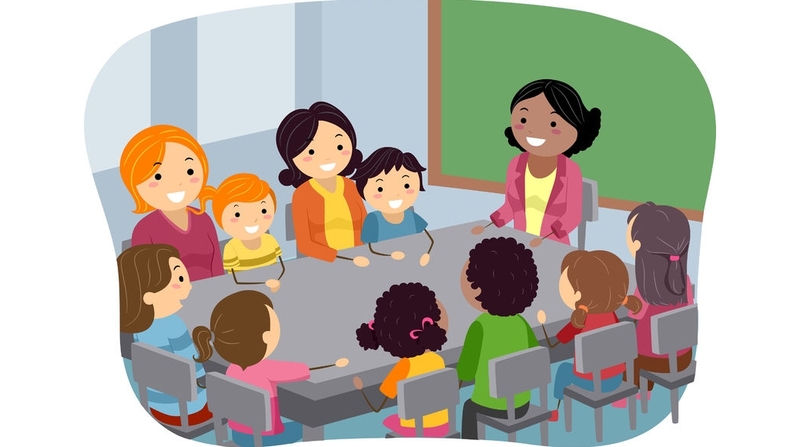 Al Jones Corporation will donate 40% of card game sales to your local school when it participates in "A Card Game Fundraiser". Call our office now at 623.205.2415 to speak with one of our staff members about this opportunity. Listed below are 11 groups we provided sample decks of the card game for beta testing, prior to the release of our retail version. The changes we made, based on their valuable feedback, are now available to you.